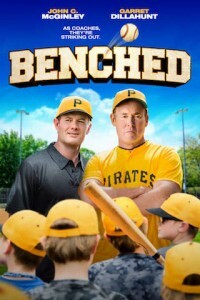 In the Benched DVD, legendary baseball coach, Don (John C. McGinley, “Scrubs”), gets inexperienced Michael (Garret Dillahunt, “Raising Hope”) as his new assistant coach. The two coaches are polar opposites as fiery Don loves to win no matter the cost and Michael is all about having fun. To make matters worse, their team leads the league in errors, strikeouts, and hurt feelings. Throughout a season of hilarity and heartbreak, Michael and Don must work together to help their underdog team. Come play ball in this heartwarming comedy about two adverse coaches coming off the bench and getting their heads in the game.